Non-enveloped, probably T=3 icosahedral particles . Monopartite, linear, ssRNA(+) genome of 4652 bp. The 3' terminus has neither a polyA tract nor a tRNA-like structure. The 5' terminus probably has a genome-linked protein (VPg). There are a total of four potential ORFs. The viral RNA ORF2 and ORF3 are translated to produce the RdRp fusion protein and the VPg protein. 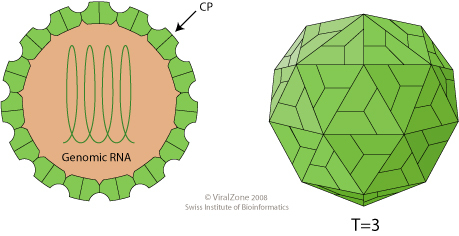 Expression of the subgenomic RNAs (sgRNAs) yields the capsid. Capsid assembly and formation of new virus particles. ETYMOLOGY Polemovirus: From polerovirus-sobe movirus hybrid. NATURAL HOSTS Commercial cultivars of Euphorbia pulcherrima.